There are many conditions that involve the eye and its surrounding structures. While some may lead to deterioration, most are highly curable. Some even do not pose a threat to the people’s health. While it is true that many eye conditions are not dangerous to a man’s physical well-being, they can be very annoying to live with. One eye problem that can be a nuisance is floaters in the eye. It is not an unusual condition, as more than 50% of the total population will have them at some point of their lives. The following paragraphs will discuss the reasons what floaters are, how people can get them, and how are they managed. Floaters are medically termed as myodesopsia. The floaters in the eye a person sees are actually debris that float on the person’s vitreous humor. The vitreous humor is a gel-like substance that fills the eye. It functions as a medium to refract the light rays entering the eye, to have a non-distorted view of the image the person is looking at. During infancy, this substance has a consistency similar to gel. When the person grows older, the vitreous humor starts to degenerate, altering its consistency. A watery substance forms in the center portion of the eye. When there are particles that suspend in this watery substance, floaters appear. The floaters that the person see is not actually the debris suspended in the vitreous humor. These are the shadows of the image cast by the object when light passes through them. There are a variety of causes that can direct a person to having floaters. The condition is commonly caused by the development of posterior vitreous detachment (PVD). It is sometimes though to be similar to retinal detachment, but they are two different conditions. PVD is a condition where the vitreous humor shrinks, commonly caused by aging. When the vitreous humor shrinks, it pulls off the retina, which is attached into the vitreous humor. These attachments can be dislodged, forming floaters. 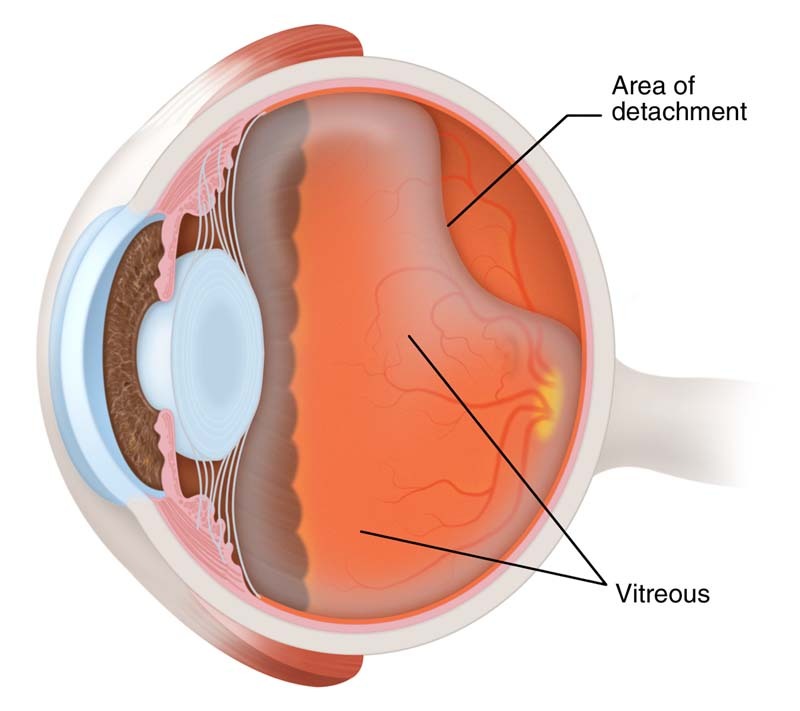 Retinal detachment is a condition where the retina tears off, because of injury and some diseases. This is a potentially dangerous situation and can lead to blindness when left untreated. The person is suspected to have a retinal detachment when there is a sudden increase in the numbers of floaters seen. When this happens, it is wise to contact an ophthalmologist to get a second opinion. Floaters are common and may persist for several years. If the floaters are in fixed in a location within the eye, the brain adapts to make them invisible. This is a process called neural adaptation, wherein the brain tunes out stabilized images. When the floaters in the eye are mobile, it can be annoying to the person, because his reflex will tell him to gaze at them. This is not possible because floaters move with the direction of the eye, keeping them in the direction of the person’s gaze. This frustration is the common reason why people seek out medical advice for floaters. Surgical interventions are only done when there is a risk of the person to go blind.